Courses :- English Spoken, Interview Skills, Personality Development, Basic Computers, Web Designing, Photoshop Training, Video Editing. "Very nice teachers, best ways of teaching and amazing experience. Spoken English classes have helped me in enhancing my communication skills. " "Turning point is a nice institute.i like the style of study..only spoken is not there,they ready to the students for ILETS also. Beacouse Turning point is giving the all types of treaning like ILETS.. Many students are coming there. Infect many students are coming from Chandigarh. So if any body want You can come for the classes. I am sure you like the all things. " "Its was a Great experience of mine with Turning point. Excellent staffs and very good environment.Teachers are very help full and friendly in nature. They not only teach to improve English but also change your personality and makes confident in you for job interviews and etc. " Which is India's best spoken English institute? How can I get more than 6.5 bands in IELTS? How do I differentiate "I can do" from "I can't do" in spoken English? 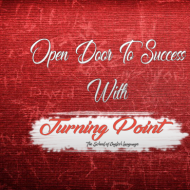 Turning Point conducts classes in IELTS Coaching, Interview Skills and Personality Development Training. It is located in Sector-60 Mohali, Chandigarh. It takes Regular Classes- at the Institute. It has got 11 reviews till now with 100% positive feedback.